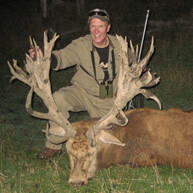 Dear *|FNAME|*, welcome to The Hossack’s 2011 hunting season review. The 2011 hunting season has now come to an end. During the season some fantastic trophies were taken and many more great memories have been created along the way. We have thoroughly enjoyed making new hunting friendships as well as hunting the hills again with some of our friends from past hunts at The Hossack. We would like to thank not only our hunting friends and the many non-hunter guests that have joined us in 2011 but also our guides, hunting camp help, cooks, cleaners and bottle washers!! The success of our hunters also depends on being warm, well fed and getting a comfortable night's rest in a good bed after a long day in the hills. We have a great team at The Hossack and they take as much pride as the hunters in the trophies that emerge from the hills at the end of each day. 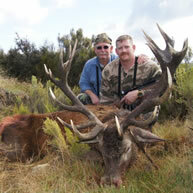 The free range red stag hunting has been the best we have ever experienced and all indications are for another cracker of a season in 2012 due to a relatively easy winter and an abundance of feed this spring and early summer. The stags are now in velvet and are growing out very strongly. 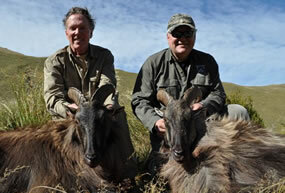 For those of you who like statistics you may be interested to know that one monster estate red stag had 43 points and went SCI 440; two wild red stags were 20 and 21 pointers respectively; the bull tahr trophies averaged 13 ¼” and the buck chamois trophies averaged 9 ½”. By any outfitter’s standard these averages are impressive and we count ourselves fortunate to be able to provide our hunters with the opportunity to hunt such high quality trophies. Our fallow deer herd is producing some beautiful bucks. Next season some of the fallow bucks will be in the SCI220 to SCI250 range. These bucks are very cunning and any hunter that secures one of them will be able to reflect back with pride on a hunt that required every hunting skill in the book plus some luck!! 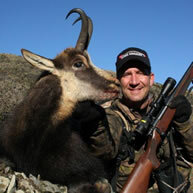 The unique pure black faced Pitt Island rams continue to produce big horns averaging a curl and a half. 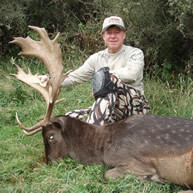 Not many outfitters offer their hunters Pitt Island rams in New Zealand. Most offer the more common black and white faced Arapawa ram. The Pitt Island rams are more impressive in our view and you will see why if you look at our Facebook or website pages. This edition of The Hossack newsletter has been sent to you - customer using [email address suppressed] by The Hossack. To ensure you don't miss out on future editions, please add redstag@thehossack.co.nz to your email address book or safe list. Unsubscribe: We thank you for reading our newsletter and we respect your privacy. If you no longer wish to receive this newsletter, unsubscribe. Subscribe: Received this newsletter from a friend? Subscribe here. Feedback: If you have any comments about this newsletter or would like to contribute, please send mail to redstag@thehossack.co.nz. Notice: The information contained in this newsletter is given in good faith, has been derived from sources perceived by The Hossack to be reliable and accurate however neither The Hossack or any other person involved in the preparation of this newsletter accepts any liability for any opinions or information, including the accuracy or completeness thereof contained in it or for any consequences flowing from its use.